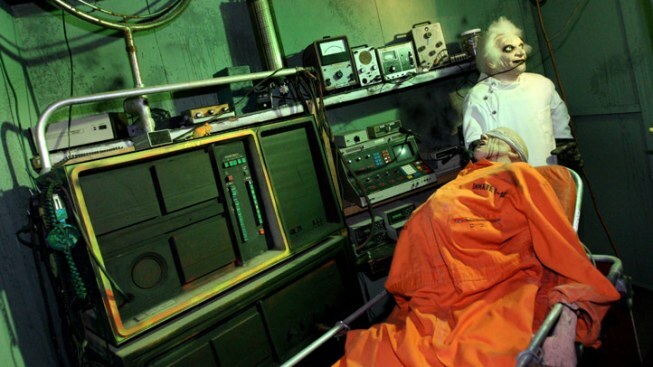 Get frightened at this Halloween "theme park" in Waxahachie. October is normally when we go full "Hallo-Scene," so it's no surprise we're looking for something scary to do this weekend that doesn't include sitting in traffic for the Rangers game, TX/OU weekend, or the State Fair of Texas. Enter -- if you dare -- Screams "Halloween theme park" in Waxahachie, a huge fairground of fear that includes five major haunted attractions plus other activities designed to keep you shrieking. Open each Friday and Saturday from Sept. 30 to Oct. 30, the park scares thousands of visitors every year since 1996. Each of the five major haunted attractions has its own self-descriptive theme; Castle of Darkness takes place in a castle, Pirates of Peril Point has undead nautical nasties, the Arcane Asylum offers Gothic terror and high doses of insanity, Unkel Koy's Klown Maze put a labyrinth and clowns together, and the Ghoulish Graveyard is a trip through a creepy cemetery. Other frights include "The Trail of Terror - Maze of the Minotaur" walking attraction that takes visitors through a frighting world of Greek mythology. Plus, watch out for the random roaming frights that may appear out of nowhere on the grounds of Screams. General admission tickets are $24.99 per person for one night. Additional costs may apply for other activities like The Trail of Terror or rides, face painting, games, etc. Group discounts are available and some area Walgreens have discount tickets as well. Lines for the attractions definitely start getting longer the closer you get to Halloween, so Screams has another "fast pass" option for $15 to get you to the front of the line. Food and drink are available in the park, including beer and wine, and guests are prohibited from bringing in their own nibbles. For even more information and to buy advance tickets, head to the official Screams website.